When developing on the server it is vital that you get as much error information as possible. revServer has a really handy little switch that allows you to tell revServer to output error messages right there in the browser. The screenshot shows the source of a webpage I am working on. 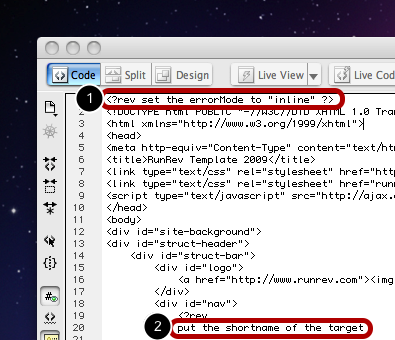 Place the following line of script at the top of your irev script. It must be on the first line and surrounded by standard "<?rev" and "?>" tags. All error messages will now be output directly to the browser. As you can see I have entered an invalid line of code. When I go to my webpage an error message should be displayed. The errors have been output direct to my webpage in the browser. Prev: How do I use stacks with LiveCode Server? Now I know how to display the errors. 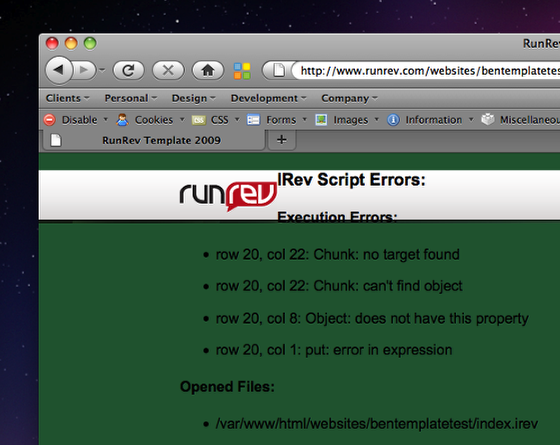 But I also want to treat the error message in the script of iRev file. Please tell me how this can be done.